Here’s a pretty awesome program you should definitely look into if you were conceived in a La Quinta. Heritage is an important aspect of who we all are, but it’s something that we are growing more and more out of touch with. And now, La Quinta Inn & Suites is doing something amazing to encourage people to connect with their roots: They’re granting everyone conceived in one of their hotels a birthright that allows them to return to their ancestral home for an all-expense-paid 10-day journey of discovery and enlightenment. Wow. What a life-changing experience for those whose parents hooked up in a La Quinta! Incredible. Here’s your chance to see all the things you’ve only heard your parents talk about with your own eyes: Bright Side Breakfast, the in-room oversize desks with ergonomic chairs, the 24-hour business center, and all the other amenities guaranteed to you by your heritage. The only restriction is you must have been conceived (or have a mother who was conceived) somewhere on La Quinta property (including in the pool or parking lot). Wow. If your parents made you in a La Quinta, you really need to look into this program. Who knows how an evening being exposed to some local entertainment in the La Quinta Lounge or a day of silent reflection in the lobby could help you get in touch with your roots? 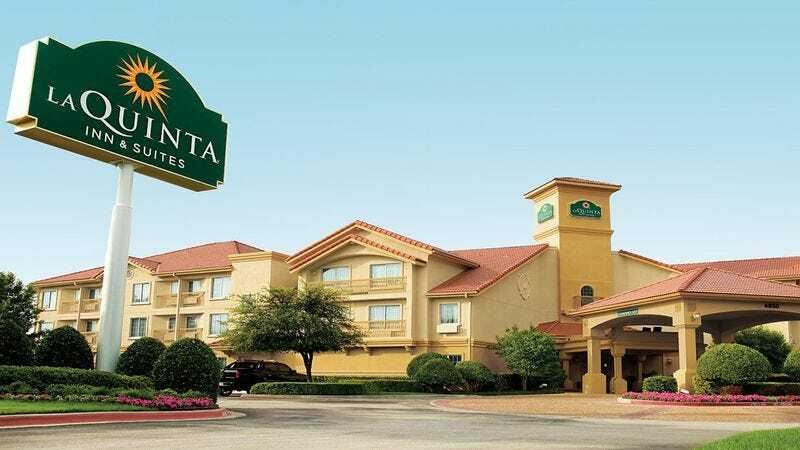 Everyone owes it to themselves to connect with their personal history in some way, and the La Quinta Inn & Suites birthright is going to make that easier for thousands of people.